Through RVCA's Artist Network Program (ANP), Steve Aoki and PM Tenore recently announced their merge of music and fashion together with the Dim Mak x RVCA 20th Anniversary Collaboration. The collection is a microcosm of each brand’s impact on both industries. The collection arrives in the midst of Dim Mak’s 20th Anniversary. Steve Aoki’s record label has spent 2016 on a world tour, playing to audiences in Barcelona, Chicago, Ibiza, Malta, Mexico City, Montréal, New York City, and other global hotspots. 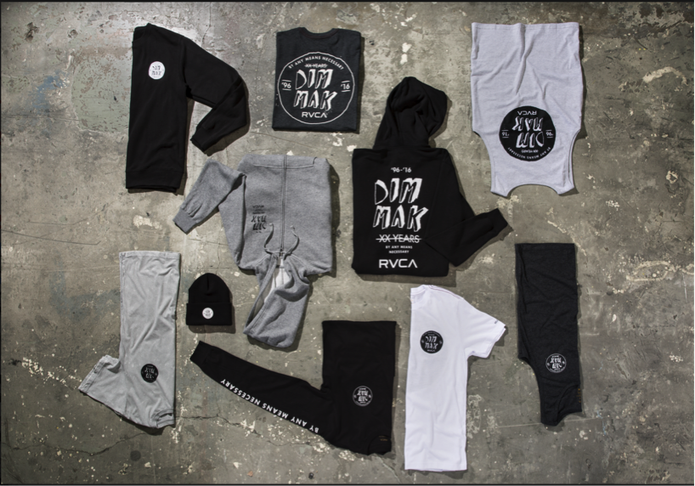 With a stop at Amsterdam’s ADE convention in the can, the Dim Mak x RVCA collaboration strives to integrate the diverse network of different subcultures with one common thread: the balance of opposites. Steve Aoki: “I’ve known Pat Tenore for over 23 years, since I started going to his skate shop when I was 15 years old. In 2006, Pat and RVCA gave me my first fashion collaboration - a custom Steve Aoki bag. Since then I’ve had the pleasure of creating alongside Adidas, Burton, Diesel, and Supra to name a few, but nothing feels better than working with a close friend. Pat's been there since Day 1 and has always believed in me. This 20th Anniversary is a special time for both myself and for Dim Mak, and I can’t think of a better person and brand to collaborate with on our capsule collection." RVCA is the brainchild of company Founder and President, PM Tenore and is a design-driven lifestyle brand. Tenore's intention from the very beginning has been to create a platform for RVCA, which combines art, music, fashion and a modern lifestyle in an original way. At the forefront of this vision has been RVCA's Artist Network Program (ANP)-a venture established to showcase the talents of accomplished as well as unknown artists.